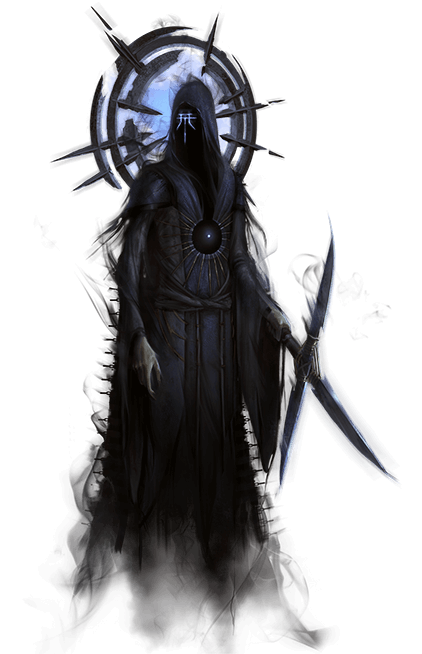 Apsu and his Ylem Clergy, hail from the great Capital City of Aeterna located in central Empyrnea. While the four kingdoms enjoy their own sense of freedom and rule, Apsu’s word and that of his clergy is considered high law. In all the centuries that have passed since Apsu rise to power, even with the outspoken First Queen of Kynazarr, none have outright rebelled against it. 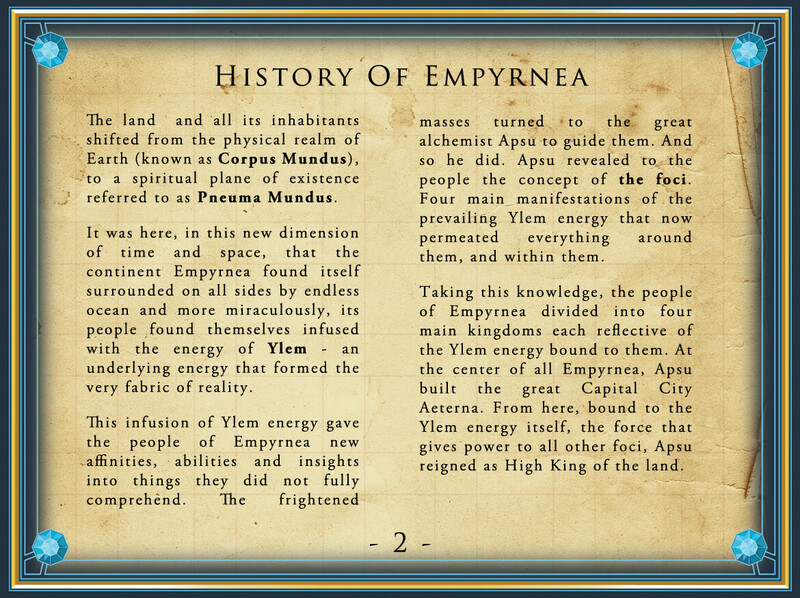 Unlike inhabitants of the four kingdoms, people in Aeterna, are bound not to a single foci but to Ylem energy itself. As with all who are aligned with Ylem, Aeternians have blue hued eyes. While most pursue studies of Ylem itself and philosophical matters of its role in the universe, many Aeternians also pursue a basic understanding of other foci as well. However, such studies of the foci are always pursued to a lesser degree than that of the four kingdoms, as it is considered an inferior field of practice compared to Ylem itself. 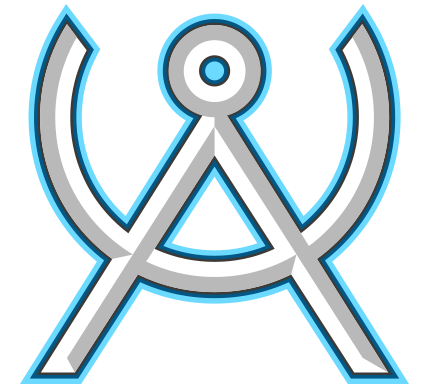 And this fact underscores the general tone throughout all of Aeterna, that Aeternians are more pure and overall superior to all other inhabitants of Empyrnea. Aeternians’s discrimination against others is mild. 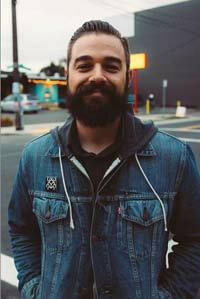 They are not a hostile or angry people, but considered more of a high-brow, self indulgent populace. Life in Aeterna is considered lavish by most others throughout the land. Aeternian attitude and way of life leads to a subtle, general tone of animosity between the inhabitants of the four kingdoms and the people of Aeterna. Many jokes are told in the four kingdoms of living like an Aeternian. The Ylem clergy or Enclave practice their rituals and hold their meetings behind closed doors. In fact, it is almost impossible to seek audience with the higher members of the council. Laws in Aeterna are perhaps the most strict in all Empyrnea and the punishment for disobeying them is harsh and swift. In recent days distinct sets of laws have been established for insulting, defying or speaking out against Apsu or the clergy. While this is a normal, accepted way of life among Aeternians, a great restlessness has been rising in the city since Apsu’s death. 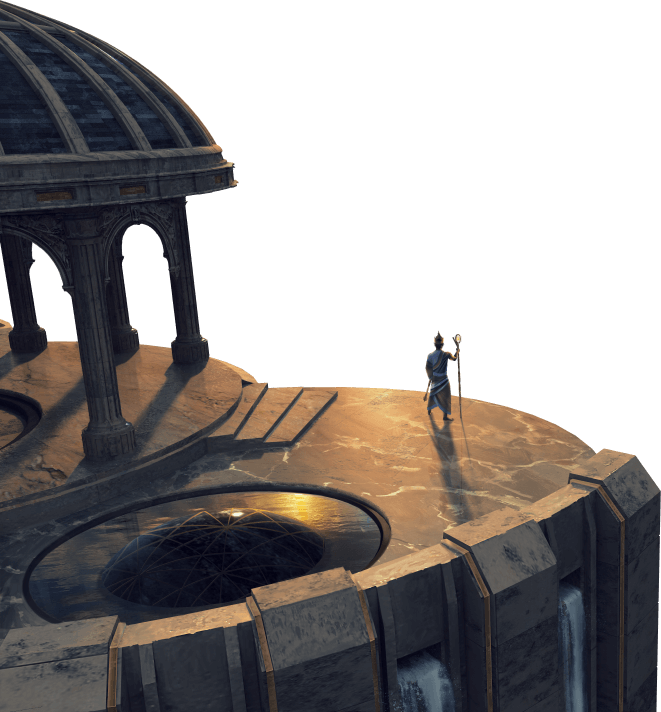 While the affliction has affected Aeterna least in all of Empyrnea, darkness grows in the Capital City. 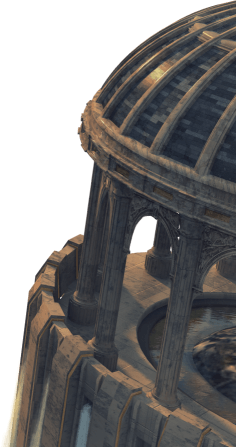 In recent days, the Enclave has been establishing churches of Ylem throughout the four kingdoms and forcing the people to abandon their foci and embrace Ylem. This has not gone over well among the kingdoms, degrading into strife and conflict in many instances. Though the repercussions have not been felt directly in Aeterna, there is a sense that something is out of balance... and growing more so each day. 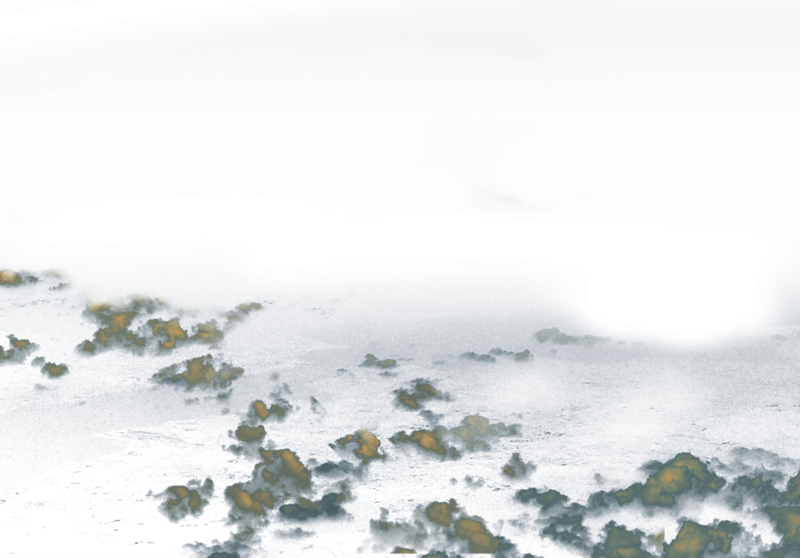 Although no Aeternian would dare speak it out loud, some are beginning to sense a change in the Enclave and see the ominous clouds of trouble forming overhead. Kynazarr is the largest kingdom of Empyrnea. It is also the most advanced city leading all other kingdoms in most areas, but most notably politics and technology. The people of Kynazarr are bound to the focus of Pyre, the form of Ylem energy associated with willpower. For only when man expresses his will onto reality can he transform it from that which it was to that which he wishes it to be. Being the largest kingdom of Empyrnea in both size and population, Kynazari are the most varied when it comes to opinion, outlook and attitudes. That said, to understand its people and the current King, Dlone Kynazarr, we must first understand the original holder of the bloodstone in Kynazaar, the first Queen, Kalea Kynazarr. 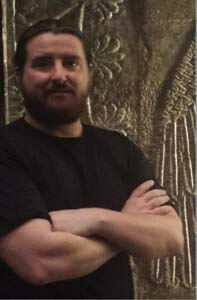 During Apsu’s rise to power in Empyrnea, only one person of influence questioned Apsu and his motives openly, Kalea Kynazarr. 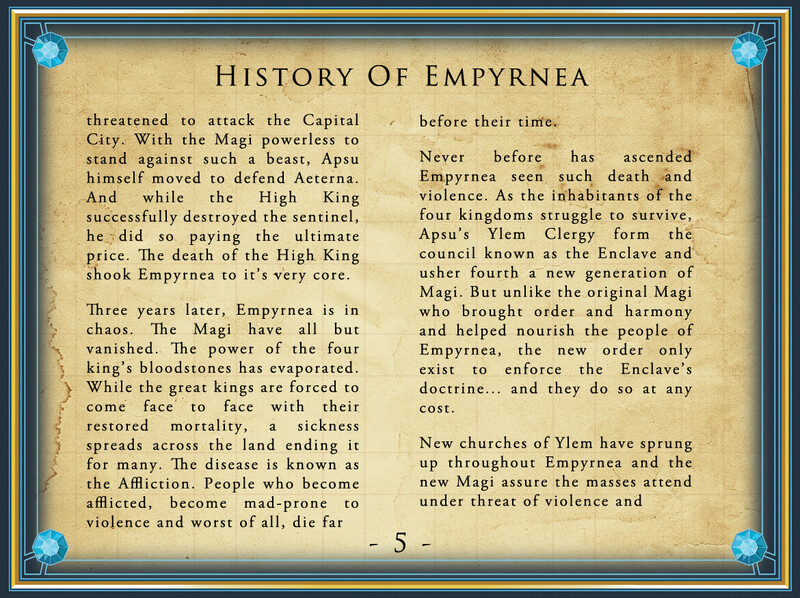 The Queen of Kynazarr, the largest most civilized city of Empyrnea called for a high council to rule from the capital city Aeterna, claiming that no single ruler such as Apsu should wield such power over so many. Many from Aeterna found Kalea’s words to be treasonous and called for her imprisonment. No such arrest was ever made and to the surprise of many, Apsu actually gifted his last bloodstone to his only voice of opposition in the land, Kalea Kynazarr. Although reluctant to take possession of bloodstone, Kalea eventually did just that. Where the other kings would go on to rule indefinitely (with the exception of the Eloden), Kalea had wisdom where others did not. The first queen of Kynazarr and the first queen alone, realized that man was not destined to be ruled over by a single ruler for time immemorial. Instead it was man’s destiny to rule over himself. Such thought was a reflection of the progressive laws already routed in Kynazarr’s republic based law system. And so, after a mere thirty years of rule, Kalea passed the bloodstone to an heir and started the only bloodstone succession of rule in all of Empyrnea. The queen decreed that no Kynazarr shall rule over the kingdom for a time more than a hundred years. Before the Queen released her bloodstone, her last official act was the creation of a secret order of Magi known as the Veil of Magus. These Magi swore an oath to investigate the kingdoms at every opportunity and uncover any plots by Apsu and his Clergy. 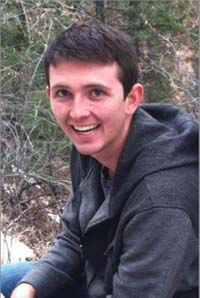 The act was considered paranoia by some in Kynazarr, patriotic and selfless by others. Since Kalea, the bloodstone has been passed down from generation to generation, falling today to Dlone Kynazarr. A fair and just king, embracing the responsibility of ruling the greatest kingdom of Empyrnea during the most troubled times. 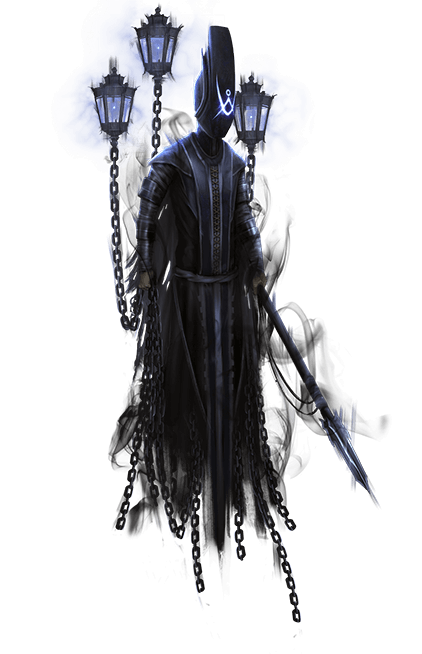 On the surface, Dlone appears to be a supporter of the Enclave and has worked hand in hand to establish Churches of Ylem throughout Kynazarr. In reality, Dlone is a traditionalist, following in the Queens footsteps more so than any other Kynazarr king since the Queen herself. 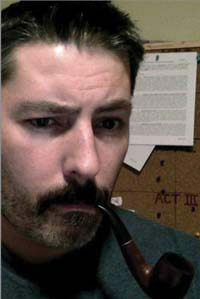 Dlone suspects the Queen’s suspicions were right about Apsu all along and feels that outright war is coming to Kynazarr. As such he has been lulling the Enclave into a false sense of security as he makes such preparations. 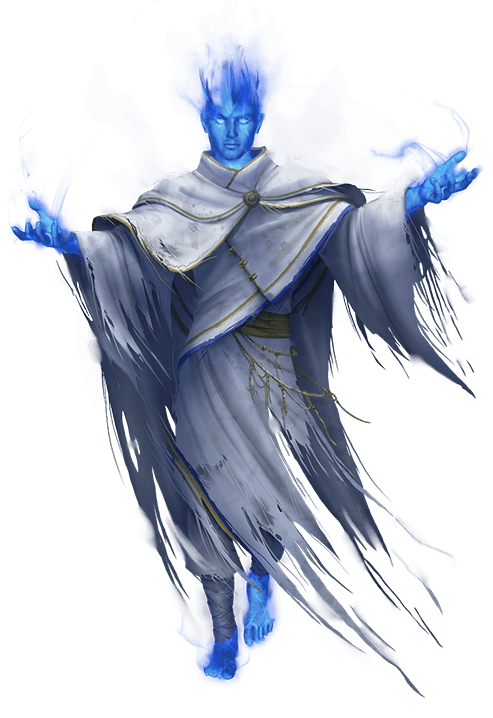 In secret Dlone has increased support to the Veil of Magus, even going as far as offering secret safe havens for the Pariah within his borders. Beyond the politics of the day, Dlone believes that salvation for the people of Empyrnea will be achieved by very deliberate effort, shaping and transforming the world to the very best of what they imagine. Intuitive planning and innovation are at the forefront of the King’s ideals. And such ideals have nurtured a kingdom full of innovations, invention, engineering and industry unlike anywhere else in Empyrnea. While Kynazarr’s rules are numerous, they are founded in a republic which grants its people more personal freedom than any other kingdom in the land. 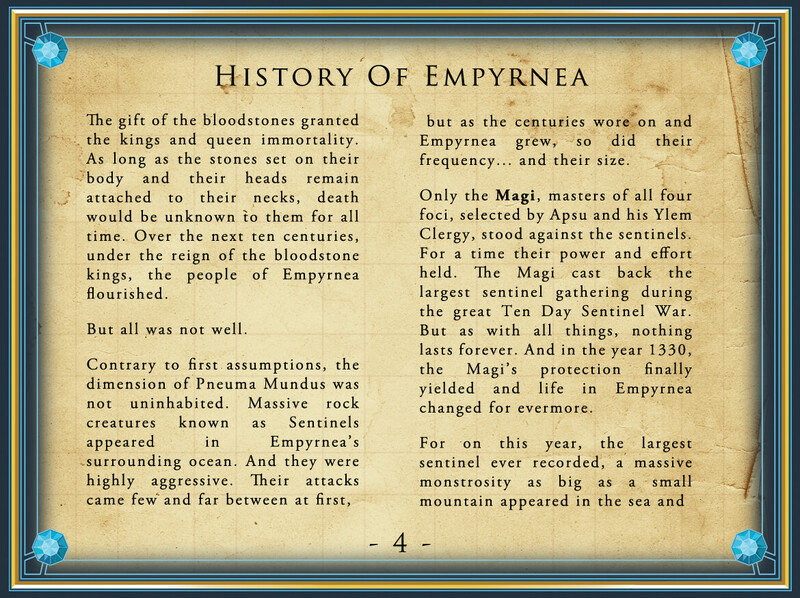 Kynazarr is known for its great debate halls and historic libraries which contain a complete record of all the human events in Empyrnea throughout history. Dlone is known as the “Rose King”, a title passed to him after the birth of his daughters, a pair of twins dubbed the Golden Rose and the Silver Rose and a third youngest child, known as the Amber Rose. 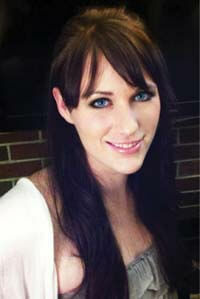 In recent years, Dlone’s youngest daughter was killed in a rogue scion attack. Shortly after the Amber Rose’s death, Dlone was forced to take his own wife’s life as she succumbed to the affliction infecting Empyrnea. Compounding his loss, the “Veil of Magus” has recently delivered disheartening news--news that centuries after the the queen’s death, validates her suspicions once and for all. Overwhelmed and distraught at such loss and such dark matters at hand, Dlone has receded away from public life into the halls of his great castle. He has left the running of his kingdom to his daughter Kalshiera, the “Golden Rose of Kynazarr”, who has taken the charge with enthusiasm and determination. The wild lands of Eloden, are home to people bound to the focus of Egis, the form of Ylem energy that permeates nature. 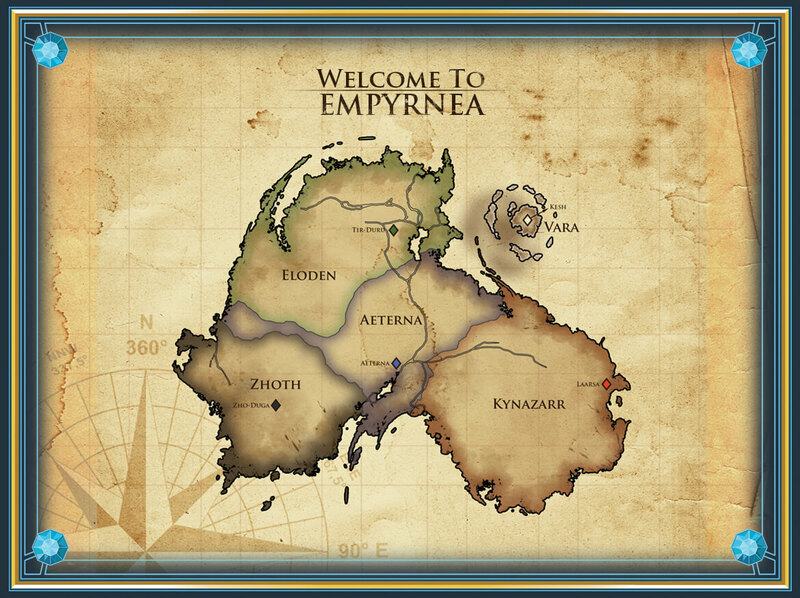 People of Eloden live a simpler way of life, compared to the other kingdoms of Empyrnea. Eloden is a tribal society, with numerous tribes living in communal village like environments. Some are extremely primitive being composed of primarily thatched huts and caves, while others have single story buildings of cut timber. Elodens farm and raise just enough livestock and food to nourish their own tribe. They are a social people and trade amongst themselves and strangers often. All Eloden have affinities for animals, bushcraft, herbalism, hunting and other natural craft. When traveling through other kingdoms, all Eloden use the surname of their homeland. Laws are basic and few among the tribes, often centered around a might makes right mindset. Tales of the king’s actions and words find their way into Eloden tradition in less than a single generation. 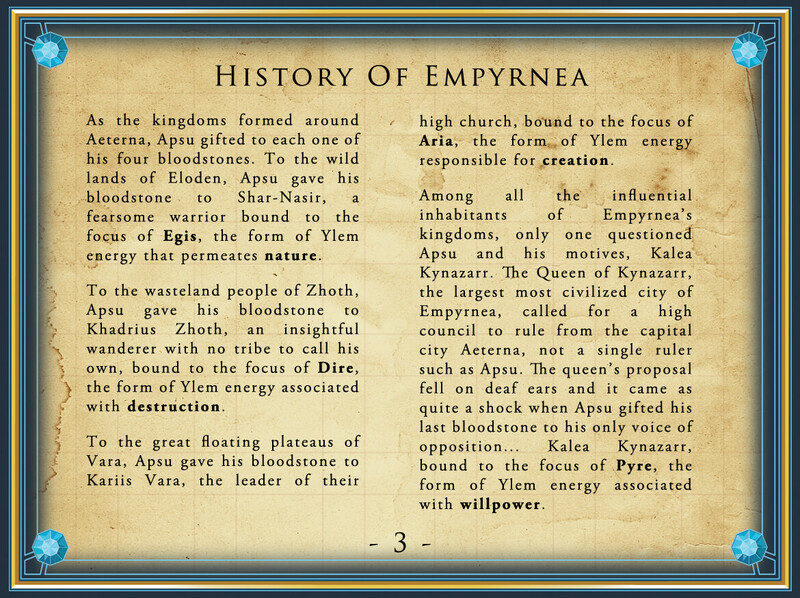 Eloden’s king and bloodstone lineage is unique in Empyrnea. The Eloden believe that only the strongest has the right to rule others. For this reason, any person may challenge the bearer of the bloodstone for control of the kingdom. 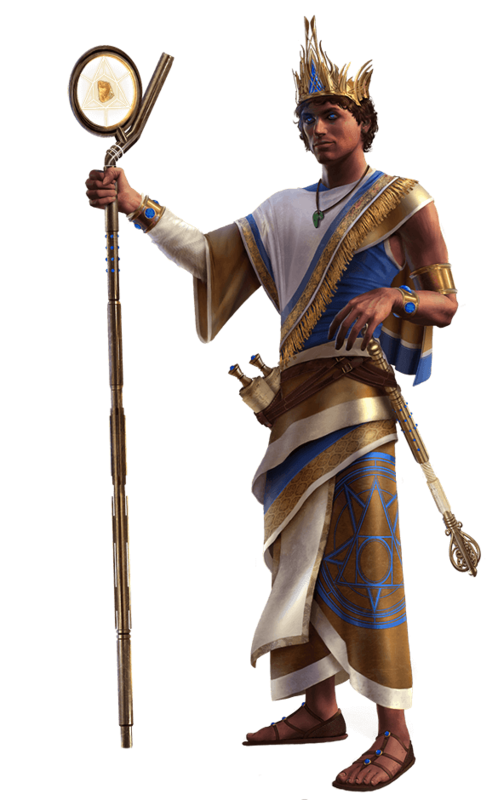 The first ascended king, Shar-Nasir lost his life in a challenge combat roughly 200 years after taking control. 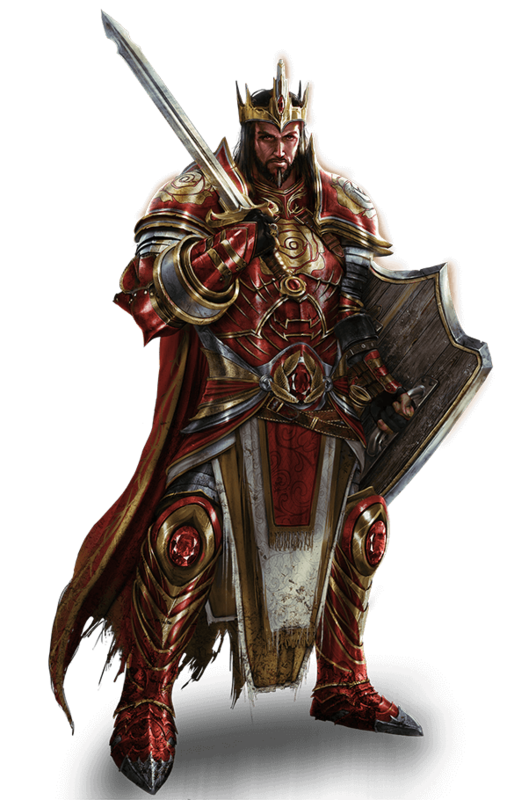 There have been four Eloden kings in total, including the current king Harromere Briar Eloden, known as “the Savage King” to outsiders, and “the slayer of scions” among his people. Harromere Briar Eloden came to power only twenty years ago, under a unique circumstance. The current king at the time, fought a rogue scion. So vicious and terrifying was the beast, that no other warrior dare face it but the king. Too much for even the king to handle, the king ‘s arm was torn from his body and with it the protection of his bloodstone. Moments later the king was struck down. Overcome with rage, Harromere rushed to the fallen king’s side and took up the fight against the scion. After a ruthless battle Harromere was victorious. Being the only person to ever defeat a scion single-handedly, Harromere was given the king’s bloodstone and his title. Till this day, Harromere wears the scion bear's corpse upon his back as his crown and constant reminder of its sacrifice and the laws of nature that govern his culture. Reflective of the Egis focus Eloden’s hold so dear, Harromere believes that truth is found in the beauty of the world around them; the streams, mountains, and skies are their friends and their teachers and all that is to be known can be learned from them. Tir-Duru, the capital city of Eloden is a massive forest village, built in ancient forest. Harromere’s castle is an elevated dwelling, suspended among the branches of a hundred trees. Unique in Empyrnea are the floating plateaus of Vara. Massive rock formations that hover above the ocean. 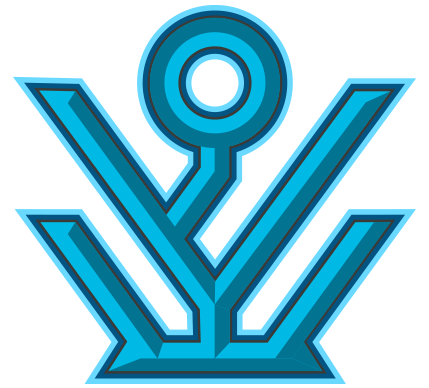 And just as unique, are the people of Vara, bound to the focus of Aria, the form of energy responsible for creation. Varan culture revolves around a central religious governing body called the Church of the Eastern Wind. Known as the most religious people in Empyrnea, Varans belief in a single creator god dates back before Empyrnea’s ascension. They believe the wind is the creators voice and Apsu is his son made flesh. Kariis Vara led the church before Apsu’s arrival and has led the kingdom ever since. The people of Vara are master craftsman and artists who celebrate life in every measure. Their culture revolves around creating the most pure and perfect expressions possible. 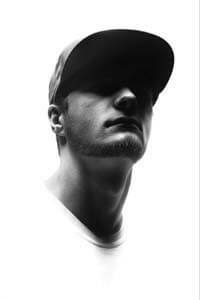 They produce music, paintings, sculpture and written verse unlike any others in all of Empyrnea. Their floating islands are adorned with many great stone structures, that are as much works of art than marvels of engineering. 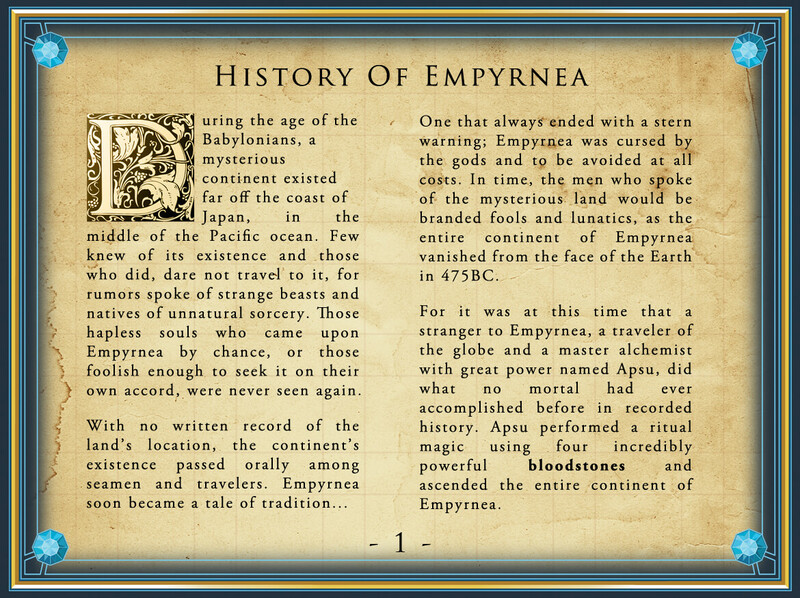 It is said by people throughout Empyrnea that for every Varan, there is a library, amphitheater or museum among their kingdom. Varans are known as a peaceful, open, optimistic people welcoming visitors and giving aid freely to any who accept. They’re also known for their great balloon floating ships which they use to travel to and from Vara. The ships were created jointly with inventors and engineers from Kynazarr and as such Kynazarr is the only other kingdom to possess such ships (although Kynazarr has a mere fraction of the airships Vara possess). A massive hundred and twenty foot tall statue of King Vara stands at the entrance to their capital city KESH. Inscribed at it’s base is the Church’s first law: “Truth is found within, when sought together.” It is the King’s fundamental belief that only by finding inner peace and completely purifying ones thoughts can a pure expression be manifested, and that through such introspection salvation can be found. Kariis Vara rose to kingly status shortly after Apsu gifted him the bloodstone over ten centuries ago. Since that time, Kariis has had many wives and fathered many children. 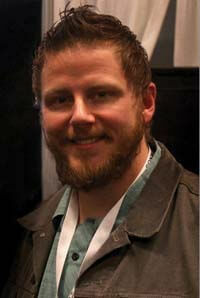 His current queen and children are referred to with the preceding title “first”. Many of Kariis Vara’s direct descendants hold high positions in the Church of the East Wind and other positions of power in the kingdom. 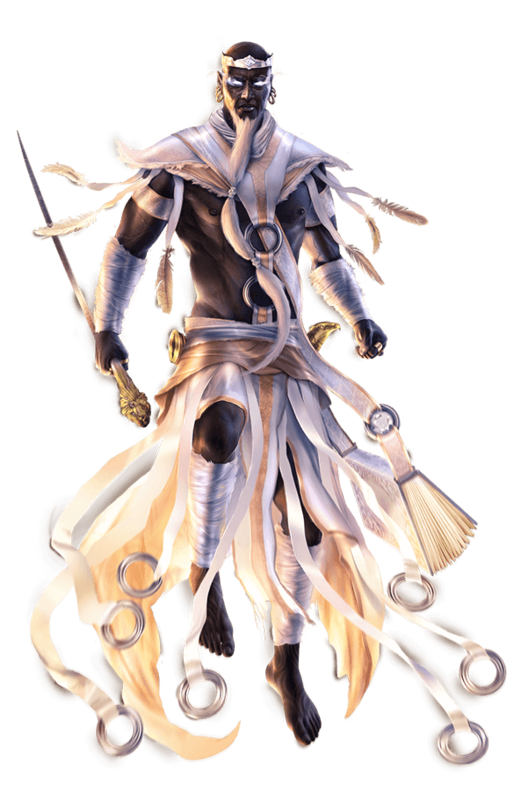 To all those of his lineage, Kariis Vara is known and referred to as Great Father. Unique to the four Empyrnean kings, Kariis Vara has fully mastered his focus. He is so strongly bound to Aria he can levitate freely and perform a host of telekinetic abilities. 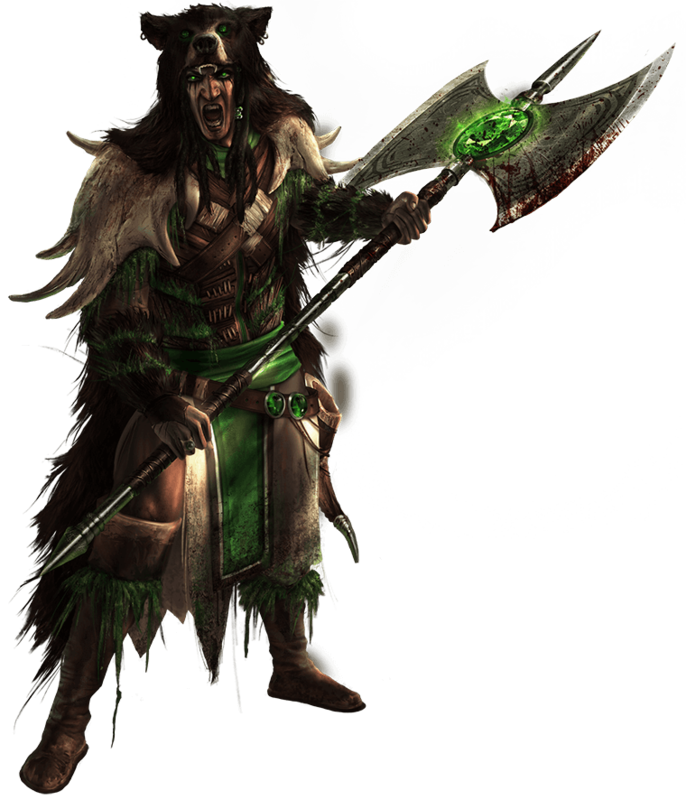 To the south western wastelands (now known as Zhoth), Apsu gave his bloodstone to Khadrius Zhoth, a wanderer with no clan of his own, but with an affinity to the focus of Dire--the form of Ylem energy associated with destruction--unlike any other Apsu had encountered. The main territory of Zhoth is covered by vast stretches of ash like ground and rocky crags. To outsiders, the region is a barren, lifeless place--a place no people would willfully inhabit. 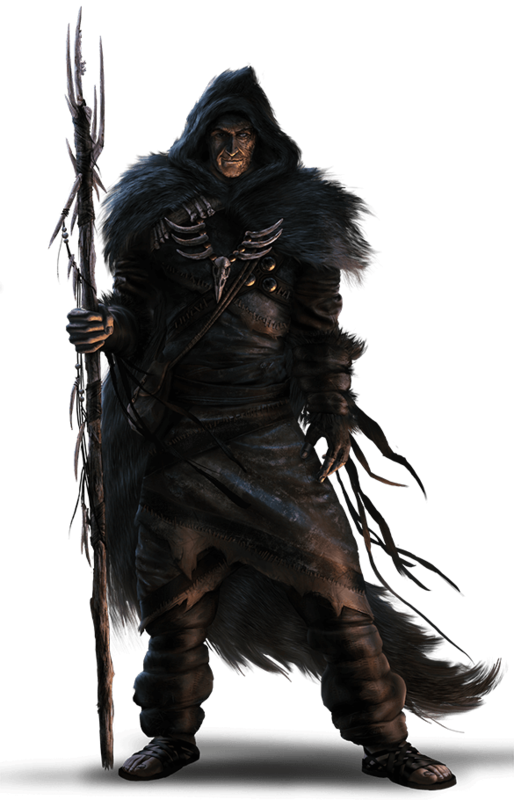 But to people of the Zhoth kingdom, the wasteland is symbolic of the dire focus that binds them to Pneumu Mundus. As with all things in life, only when they are reduced to their most basic forms can they be revealed for what they really are, understood and mastered. To the average Zhothan, the wasteland is just as life giving and sustainable as any region in Empyrnea, you just need to know how to see the truth buried beneath the surface. Like the physical region they live in, the very nature of their dire foci, is misunderstood and ostracized by practitioners of the other foci. For dire is first and foremost associated with darkness, that which all things are born from and that which all things return. This close association, fascination and focus on the destruction, reduction and death of things, leads to bizarre stereotypes, rumor and a general distrust of Zhothans. A cultural image only hampered by the Zhothans ritualistic ceremony performed in unlit, pitch black chambers (to which all Zhothans have unhindered vision) wearing death shrouds and costumes of their afterlife deities. It’s a true misfortune that most outsiders do not investigate dire, or the lands of Zhoth, long enough to see the positive that comes from their focus on the negative aspects of existence. Zhothan laws are considered fair and just, albeit confusing at times. Their legal system relies heavily on custom, and tradition, stemming from a single bible of law written by Khadrius Zhoth himself shortly after he came to power. Like the rest of their culture, it is tightly woven around the dire focus and difficult for outsiders to grasp. Khadrius Zhoth has been the single King of Zhoth since its formation over ten centuries ago. He has never had a child and has taken only two queens during his reign. The first was shortly after acquiring the bloodstone, the second was only a few years ago. Together, Khadrius Zhoth and his queen Ninsuna, rule from a great mountain range near the southernmost coast. While many Zhothans still live out among the wastes, the majority of the population resides with their king and queen in a vast underground city, deep below the tallest peak in the southern range. Due to the natural protection afforded by Zhoth’s underground dwelling, King Khadrius has been the least motivated to unite with the other kingdoms to face the sentinel threat. However, even the king of dire knows that his kingdom is not invulnerable and is willing to do whatever necessary to secure the future of his people. 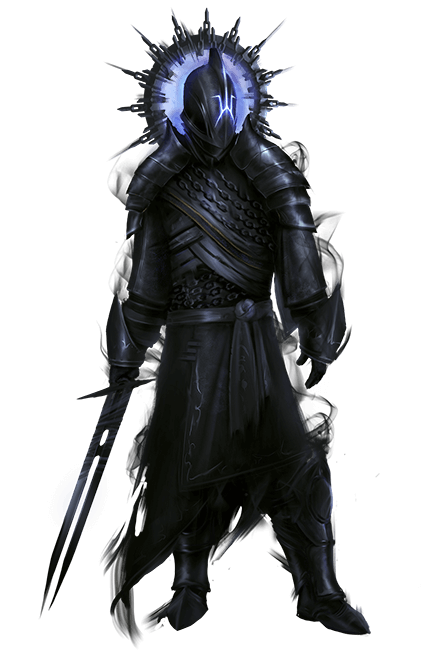 Khadrius Zhoth is known as the “Midnight King” for the vast time he spends in darkness contemplating his focus, the energy of Ylem and the universe itself. Many among his people believe he can turn his physical self into a shadow and drift up among the stars, searching the heavens for answers beyond mortal comprehension. 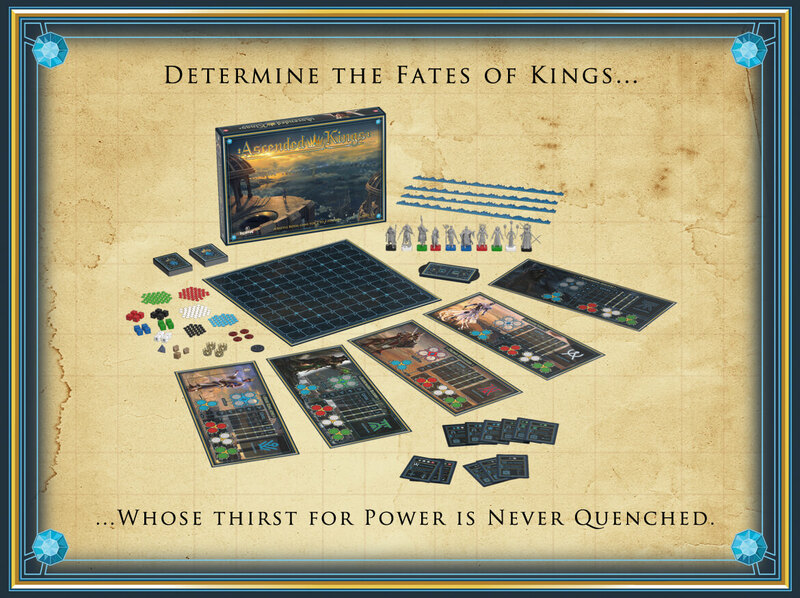 Ascended Kings is a Battle Royal game (free for all fight to the death) with a twist: there is no player elimination. There are Fire Walls that push players closer and closer into combat, increasing the intensity at the end of each round. Players use gemstones as forms of power to perform actions to move, attack, and defend themselves. 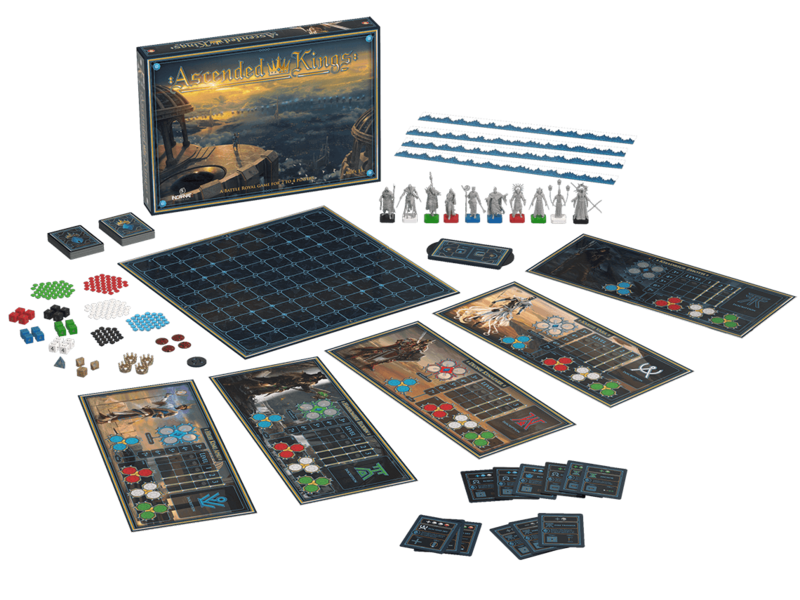 In short, it is a miniatures, card and dice fantasy action arena combat game. 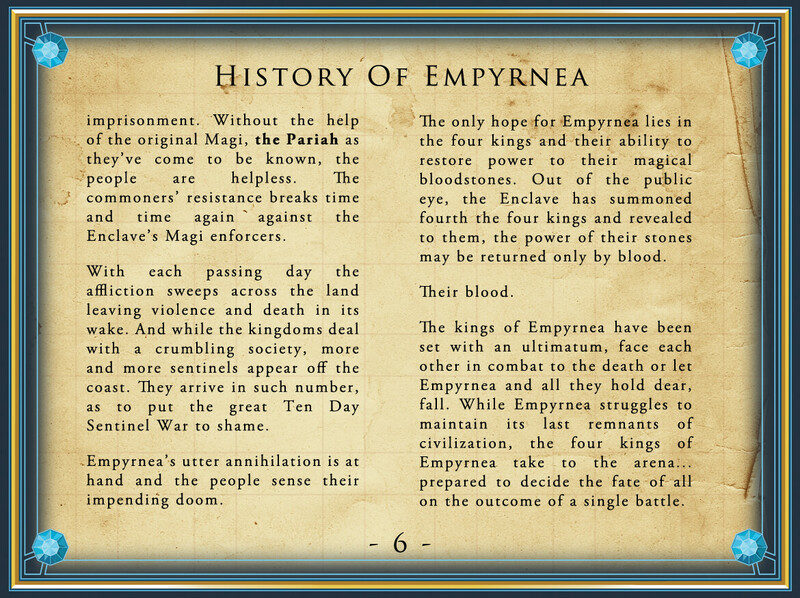 It is thematic, when you start the game you are playing as one of the 5 kings of Empyrnea, called forth by the Enclave to the arena for the Battle Royal. Once a king dies, he is DEAD, having fulfilled the aspect of Battle Royal. 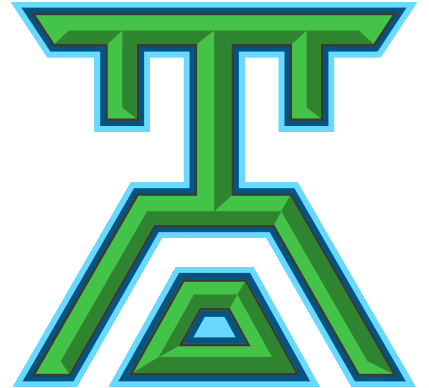 There is no player elimination because players continue to return as entities known as Revenants, which are completely different characters. 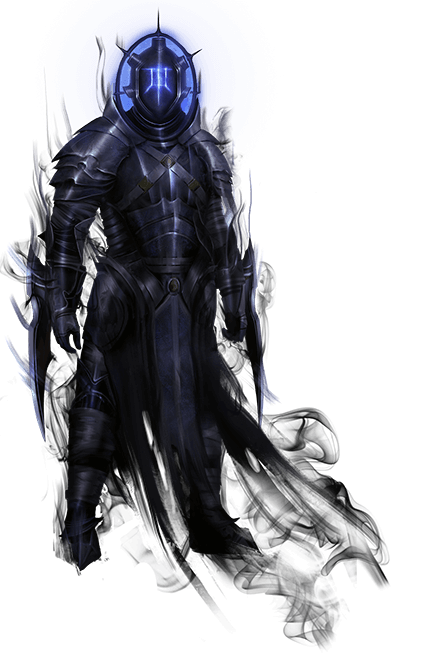 The Enclave is a syndicate of Ylem Priests who rule over Aeterna in place of the late High King Apsu. Since the High King has died, the bloodstones have lost their power, therefore making the Kings mortal again. They have recently learned that the bloodstones can regain their power through willing sacrifices of the Kings (in a fight to the death). Read the graphic novel to find out! Because they believe that by uniting all 4 of the bloodstones through willing sacrifice it will rejuvenate them thereby restoring the victor’s immortality. Foci are forms of focus power born within, and are all derivative of Ylem: the original substance from which all things are made. Foci represent a surplus of innate motivations or instincts of the character in the form of gemstones, which can be used to execute the will and behavior of that character (actions). Each focus gem shows a small piece of what the character is capable of, and most likely to do. 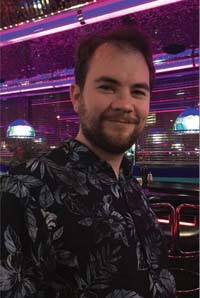 The Latent Combat System is an original innovative gameplay mechanic that separates a player’s turn into one of two states, the Latent State and the Active State. The Latent State involves rolling dice to attain gemstones. The gemstones attained can then only be used while in the Active State. When it is not a player’s turn, they are in the Defensive State. Players are in a passive mode during this state where they react to Active players by blocking attacks using Egis gemstones. There are two ways a card can be used, 1) “cash it in” for the gemstones displayed on the top margin at any time , and 2) be used to cast spells called “Focus Abilities” during a players Active State. Nearly all cards have a target and effect described on the card. You must attack them with Pyre gems and/or focus abilities to inflict Dire Wounds. If a player takes too many Dire gems they will perish and return as a Revenant. 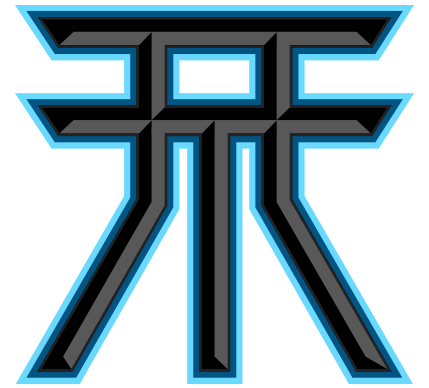 Revenants are mysterious beings that get called forth from the Traverse when a massive amount of Focus Energy passes through realities (the Traverse is the conduit space between life and death). When a player is returned to the board as a Revenant they have powerful new ways to play the game. The objective is to claim all 4 of the bloodstones. Each player starts with a bloodstone and, if they are defeated, they will drop those bloodstones on the tile they were slain allowing other players to pick them up. Once all 4 bloodstones have been united, the Omega Stone appears. If the player with all bloodstones cannot be stopped from claiming Omega, they win the game. 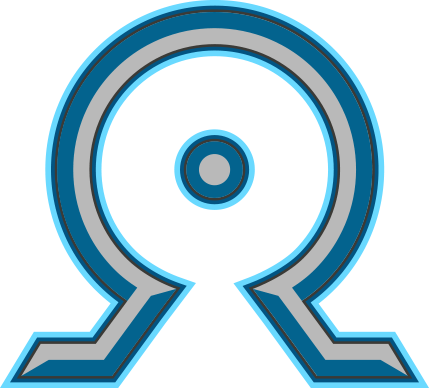 The omega dial is a device used to create Immolation Events on the board, and it is also used as a countdown timer (if players wish) to artificially initiate the Omega War if nobody can claim all 4 bloodstones within the chosen number of rounds. The Omega War is the endgame period of the game wherein players are attempting to prevent others from claiming the Omega Stone and in turn, attempting to claim it for their own. The period before this is called the Bloodstone War, wherein players are still battling for the bloodstones. 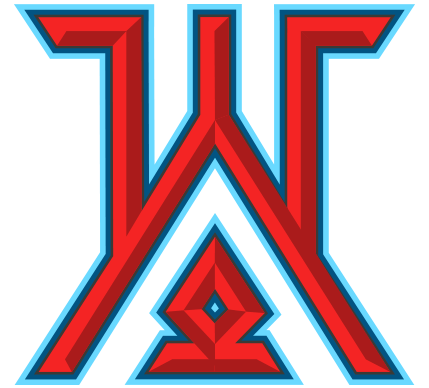 Aside from it having original innovations like the Latent Combat System, the Fire Walls that push players closer into combat, and no player elimination in an arena combat game. It’s also very fun, sign up to play it with the designer during your time at GenCon! Our lore has been meticulously crafted by some of the best writers in the industry. Username Email Repeat Email Password Repeat Password Receive Email and Become an Omega Member?